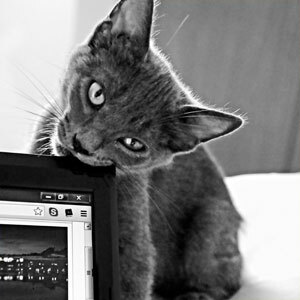 Ahhhhh, it's a kitty chewing on a Windows computer... how adorable!! You're never gonna leave now! There are a variety of tactics available to help people find your website... some that you can spend a ton of money on, and some that cost absolutely nothing but are just smart design. I won't minimize paying attention to SEO strategy (Search Engine Optimization) when building your website... after all, if they can't find you, there's not much point to having a website, is there? What I will say though is that I've seen sites where strong SEO was 90% of the thought process in the site build and, though I found them, and clicked on them... it was a pretty unspectacular result. I am a firm believer in finding the balance between getting them there... but also KEEPING THEM THERE (sorry for yelling). That kind of stuff can only be achieved by spending time developing great content, making the site pleasant looking but load quickly, and making it easy for your clients to get around to the stuff they really want to see. I'm as interested in the stats about "Time On Site" and "Bounce Rate" (ask me about that one) as I am about traffic flow. I will be happy to work with you to discover that happy place where, kitties, puppies and your pet budgy, Harold, can all live in harmony... oh, and the website will work well too. More sites in progress and coming soon!